Once again I've been looking at other trainsim sites just to see what's happening there with MSTS. I note that there is an abundance of Indian railway routes and stock available as freeware on trainsim[dot]com. I was wondering whether anyone has downloaded any of these and if so are they able to comment on them? They would obviously give an opportunity to experience alternative railways. I have not been on there for while now to see what's new, but I have downloaded some Indian routes and stock in the past, for the most part they are excellent and well worth downloading if you want a change. The Russians are very meticulous with their attention to detail in their MSTS content, some of the innovations that we now take for granted originated with the Russian and Eastern European content creators. Many thanks for the heads up. I'll also look at the Russian site you refer to, but is there any particular route there that you would recommend? If you like Narrow gauge, the "Industrial Community" route is excellent, any Russian/European 750mm gauge stock will run on it. As for the others, just read the description to see which ones appeal to you, they are all good, I was running "Route PermII-Kungur-Palniki" earlier, that one is a well detailed route. a lot of the other Russian routes I have are no longer listed, I haven't got the latest 3 routes yet, I'll have to download them now I'm back up and running again. Thanks for that Mark, and I'll do as you suggest. There are some good South African route too over on Train.com, but unless you have a subscription, downloading any can take a long time as you are limited to the number of downloads you can have per day. As with some of the American routes, they have large files and some as many as a dozen are required for each whole route. I have a number of American routes stored on CD's and several of the pay ware routes, Feather River being one of them, which I purchased when it first came out. I don't use them much these days, but they all add to my collection of MSTS material and they are there if I decide to run them for a change. I've been downloading some US routes, and in particular the Pentecosta (Petite Arbre) route which whilst fictional has it's own stock and there are also some activities. I wasn't aware that there was a download limit on Trainsim[dot]com, although not being a premium member means the downloads can take quite a while! I've managed to download all of the stuff associated with Pentecosta but not installed any. However I will look at the SA routes. I also intend to look out for European routes. Australian routes are already downloaded and in the case of Brian's recent NSW NW route installed and a little exploration carried out. Definitely one to be recommended. I want to have some alternatives for when I spend more time driving. If you have never seen V5 of this route, prepare to be amazed, you can travel round this route all day without seeing the same thing twice, no two islands are the same. Mark, are there any activities foe Seaview 5, preferably steam? There are a few acts floating around, there may be some acts for "the General" (Old US wild west style loco) I have seen screenshots of it being used on there, I normally do my own acts for Seaview as not all available acts work on v5. I'm going to download this act and give it a go. Sorry to go off topic (Indian Railway Routes) I already have Pentacosta Alec and all the stock to go with it and it is a very big route. one of my favourite American routes is Moffat Tunnel Route V5, which has some really wild scenery in parts. Try running a Big Boy over the old Rollins Pass, loaded with about fifty loaded coal wagons, instead of taking the much shorter Moffat Tunnel route. It is quite a climb to the summit at Corona, but you will need your brakes on the decent. Then carry on to the end of the route with some more spectacular scenery. Those Big Boys & Challengers are really enjoyable to drive, especially double headed with over 100 wagon loads. Just watch them snake up Rollins Pass, quite spectacular. All these routes already mentioned are worth having, as an alternative to running British routes and they don't take much space up if you have them stored on CD/DVD or even External Hard Drive. I even have a copy of MSTS & Trainstore on my external hardrive, just for running Amercan and other foreign routes. I just plug it in if I need it. Don't apologise for going off topic as the links and discussion being generated are excellent. I've even changed the topic title to suit. In order to avoid a day with no posting, I'll just mention that between shopping with SWMBO I've downloaded a number of US routes. Decided against adding premium membership of Trainsim, and to accept the download speeds for non-membership. Yes you are right, there is no download limit for non subscribtion on Trainsim.com. As I stated, I already had the Pentecosta (Petit Arbre) route, but mine was V3. I have noticed that it has now been upgraded to V4.1 and the file is for one big download. So I decided to download it which took me five hours. I already have the stock and activity file which come as separate downloads. I don't think there are any new stock items, but the route just keeps getting larger. I had a quick run on part of it last night, in the area around Nienke. This part of the route has some pretty long winding gradients, on spirals, through tunnels and over some pretty spectacular bridges. 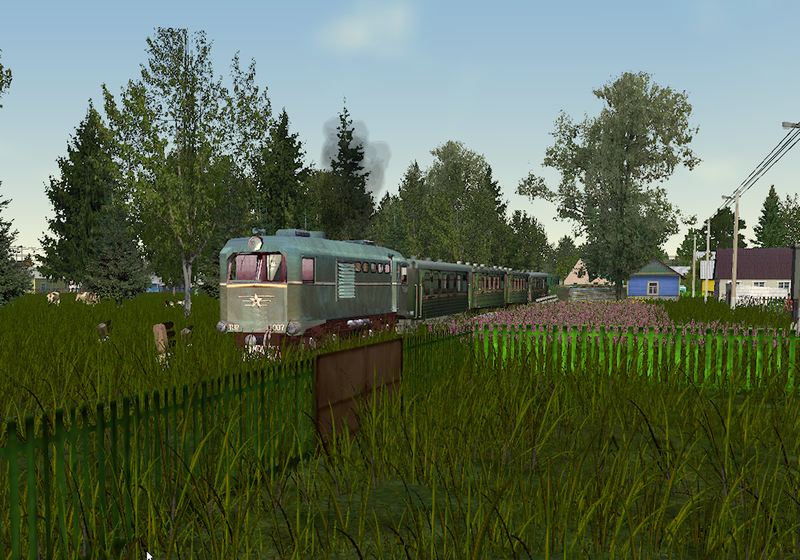 The scenery is also quite enjoyable and there is plenty of static stock placed around station yards, which if running just your player train, adds to the enjoyment. So on the whole, this looks like a route to go exploring again. I have never tried any of the activities, but there seems to be plenty of them. I think I will set this route up as a Mini Route, as there are quite a lot of items required in the train set and consist folders. I might decide to download the latest Seaview Route, but as this is just a fantasy route, I don't think I will run it too often. I am just curious to see what it has to offer that's all. Taking a look at some of the Indian Routes too, as some of these seem quite interesting. Is there any end to this age old sim? You can always seem to be adding to it, without having to spend anything, that's the beauty of it. Who needs the other sim! Does anyone know if there are any MSTS New Zealand routes available out there please? I have also recently downloaded the Australian short South route covering 107 miles from Sydney to Wallerawang and 140 miles from Sydney to Golburn. It is an excellent route set in the 1950's-60's era. However there does not appear to be any activities so I have no idea of how trains were formed or where they actually went to especially in the Sydney suburbs. I have downloaded quite a lot of NSWGR Loco's and rolling stock, any advice most appreciated. Yes there are four New Zealand routes over on Trainsim.com You need to register to download anything. Log on then click on File Library at top of page, Choose Advanced Search, then type in New Zealand Routes, click on Search at bottom of page and you should get four pages of New Zealand Routes. You might have to look through the Loco Files from the main trainsim list to find New Zealand locos and stock, but there are some available. Hope you find what you are looking for Andy. Just select MSTS in the simulator drop down box and New Zealand routes in the download type drop down box, then display results, you'll get a list of 6 route downloads. Thanks for that Geoff and Mark. I was not actually aware that there was any New Zealand stuff around! discard or open. I chose the latter, assuming that not many people download from that site these days! 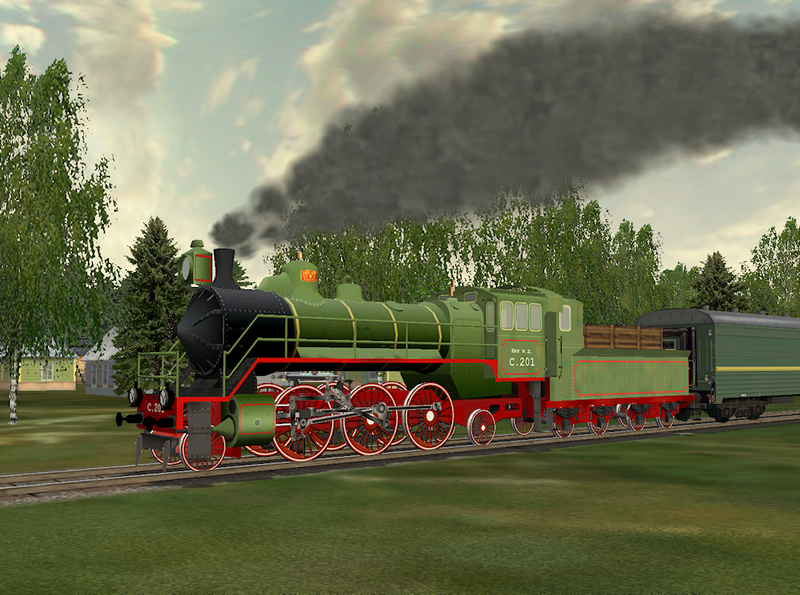 Anyway, I have South rail, North Rail Raurimu incline and spiral Routes downloaded, plus various Locos/Stock. Are you using Chrome? I get that very occasionally, but I've no idea what triggers it! andrew moody wrote: Hi everyone.............................................................I have also recently downloaded the Australian short South route covering 107 miles from Sydney to Wallerawang and 140 miles from Sydney to Golburn. It is an excellent route set in the 1950's-60's era. 1. There are NO Australian activity writers in the Australian MSTS world - some authors do include a sample activity just for an Explore type run. 2. 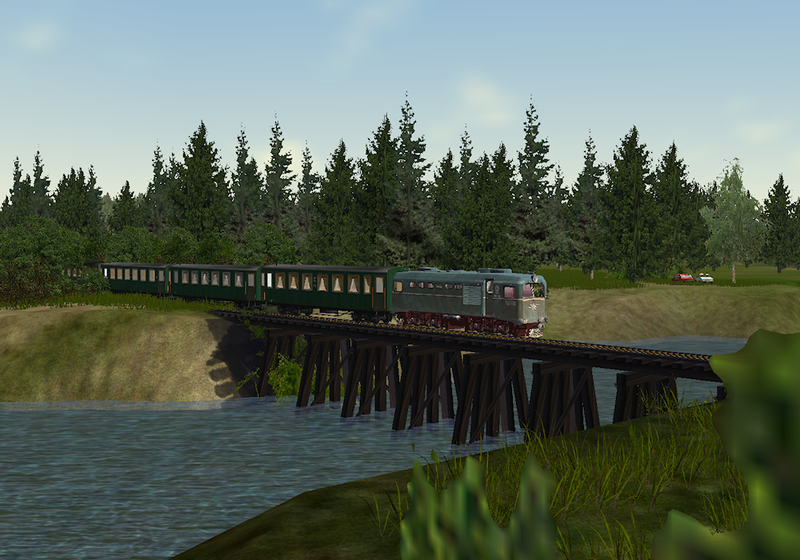 Australian rolling stock is hosted over several MSTS websites, some of which have restrictions - also there are several Payware packs from Team-Alco. The logistics of trying to setup a good Trainset with realistic Consists to go with a route is nearly impossible, especially when the Payware stock is so essential to a realistic representation of NSWGR, and they have no freeware equivalents. My skills lye in route building, structure building and rolling stock building- I don't have the skills nor the time to make activities at this stage - once I've exhausted all the NSWGR routes that I want to build, then maybe I might have a go at Activities. This covers a very wide range of NSWGR stock that I got sick of waiting for someone to build - so I built it myself. Most of my stock is duplicated here, but CTN also hosts most of the other NSWGR stock available from other authors. I still have three routes under development, but once I'm free of them, I'm thinking of assembling a comprehensive set of Consists, using only stock from my site and the CTN site, that can then be used on any of the NSWGR routes. If I get to the stage of making activities, then everything would be in accordance with standard NSWGR practice of the 50's and 60's - I grew up with this stuff, so it's in my blood. On the suject of New Zealand routes, I have permission to distribute several of them. I used to send these out on CD but now could do so using Hightail, as I did for the KWVR. The routes are authored by either Trevor Burt or Neville Brook (the latter being the author of the Making Tracks fantastic Evesham Branch route). If anyone is interested in one or more of them, drop me a PM with your email address. P.S. If you're looking for something really different, try the Rimutaka Incline route with its center-rail grabbing Fell engines. It is not uncommon for Norton to quote a similar message in particular for "xxxx.exe" files. It all depends on how many simmers, who also use Norton, download any particular file. Thanks very much for your replies, I am very impressed with the NSWGR Short South Route out of Sydney, Brian, Its extremely well done especially the scenery. and will come in very useful for my short stay there next March/April. I have also read your uncle Charlie's stories, As a recently retired member of traincrew (I was a guard for just over 40 years) I can easily relate to them! I take it that when he tells of an incident with Loco 6029, this is the same Beyer Garrett that has recently been restored to main line condition? There is also a missing consist called yard one player, If anyone can tell me the contents of the consist, I can use ConBuilder to easily make it. Am Currently still downloading Diesels and stock so keeping me busy. but looking forward to exploring the various routes. Where did you get your Northrail from? I know that some of the download versions of the NZ routes have errors in them. I downloaded all the NZ routes that you sent me Bob, last night. It took about four hours to download them all, but I now have them all safely stored on my external harddrive. Maybe Andrew got his download of Northrail from trainsim.com, as the download links you sent me by email are all valid files. Once again Bob. thank you for letting me have them. steamnut44 wrote: I downloaded all the NZ routes that you sent me Bob, last night. It took about four hours to download them all, but I now have them all safely stored on my external harddrive. Yes, it is the Train Sim New Zealand site TSNZ , I have installed y tracks, thought that might be the cause of the problem, but it is not. Have had another go at Downloading Northrail, everything else works, its 970MB. But still cannot extract the route from the zip file. I know how to reply to an incoming PM but have no idea how to create one on this site! Yes.of course! Right under my nose!, Thanks for that Geoff. Bob you have a PM. So tomorrow its another attempt from the cog side. In the first instance no problem as it illustrates the quality of the recommended routes. I've yet to install any of them myself. I don't know how useful the SW+SS route will be for your visit next year - all the current rolling stock is quite different, today's track layouts bear no similarity to those of the 50's, and all the railway infrastructure has changed - maybe if you're lucky you might find 5% still in place scattered all over the system - even some of the 50's stations have closed! And, yes, it is the same 6029 - do a search on U-Tube and you'll find several nice videos of 6029 on its recent test runs - also search the name BWDVD and you'll find some NSWGR steam including the famed 38's. One of the great tragedies here at the moment is that the stupid authorities (State and Local Govt) are ripping the heavy rail out of the centre of Newcastle - it will be closed on Boxing day. This weekend and next, Laughlan Valley Railway are running a couple of last steam specials into Newcastle for the last time using a 32 and a 59. The tragedy is that we have two nice preserved 38's, and they were the mainstay of Newcastle express services for over 25 years, but at the moment BOTH are out of service - it would have been most fitting if 3801 and 3830 could have taken the last ever train out of Newcastle terminus. Unfortunately, I'm over 850 klms away and can't attend, but I did at least travel behind 3801 and 3830 during the 150th celebrations in 2005. First of all, I want to say a BIG THANKYOU to Bob Latimer for sending me the files and as a result I nearly now have North Rail up and running. I say nearly, Because on attempting to open the Northrail route, I was bombarded with loads of "Failed to open shape files error messages all beginning with the letter Y.
Hmmmm Interesting, Y......Ah yes Ytracks. I take it that the folder does not live in the main Global folder but should be extracted into the shapes folder? Will give it a try, If it does not work he last previous file is Yardmarker ace. But once again thankyou Bob very much. Also it is nice to see that it has generated quite a bit of interest as well! Not sure what you have done but once you unzip all five zips into a temporary folder you will have Global, Route, Sound and Trains folders plus the instructions. You then should have, following the instructions, moved those four folders into your Train Simulator folder. Inside the Global folder is a shapes folder which contains all of the Y-Tracks shapes. Check in the Global\Shapes folder for Y1t190-1-9_12mDiv.s and Y1tSglSlip190Xover_.s Those are just two of the 27 YTracks shapes. Is the error message really "failed to open" or is it "failed to find"? What tsection.dat are you using? Just to confirm that Northrail now runs Ok, Y tracks ARE were they are supposed to be!!!! The T section is the latest one 42UK. Just taken a BNSF GP38 (re-gauged?) from Wanganui to Armoho on a exploration run. Yes, North rail is another great route very well built. ShortNorth wrote: I don't know how useful the SW+SS route will be for your visit next year - all the current rolling stock is quite different, today's track layouts bear no similarity to those of the 50's, and all the railway infrastructure has changed - maybe if you're lucky you might find 5% still in place scattered all over the system - even some of the 50's stations have closed! I picked up the bit about Newcastle on one of the UK railway sites I read, Absolutely bonkers! I was hoping to go there for a day but looks like I wont make it now. unless there is a last minute reprieve! Might try a day trip to Canberra instead, and try and locate the railway museum there. Yes I bet that the railway system around Sydney has like everywhere else been reduced and land sold off. I am looking to be able to photograph some freight trains to and from Botany, Is Flemington any good? andrew moody wrote: ..................................Might try a day trip to Canberra instead, and try and locate the railway museum there. Not sure about Flemington, all the goods sidings (stockyard and related industries all gone) probably all you'll see are suburban electrics with the occasional passing South or West XPT and a couple of odd freights coming out of what is left of Enfield. The Canberra trip is a nice run, and if you want another nice scenic run try a trip from Sydney to Nowra down the Illawarra line. If you do decide to do this, have a run on my Main Illawarra V3 first, to see what it looked like in the 50's/60's, and compare it to today's line. have spent quite some time today attempting to install the AU_NSW_MI3 Route but without sucsess. This is UKTS 1211 platform kit 1V which I have redownkoaded and copied the files into my main Global Shapes folder, all four of the ace files are also present in the textures folder but despite reinstalling them all. 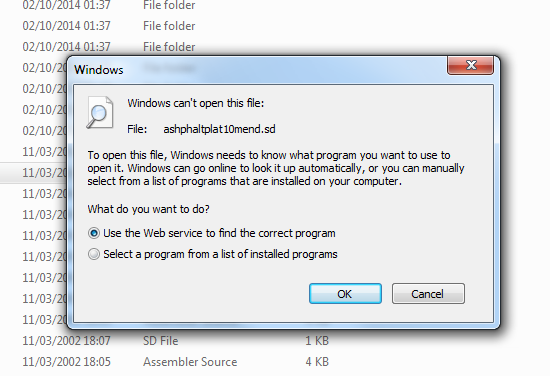 I am still unable to openAU NSW M13 to install. 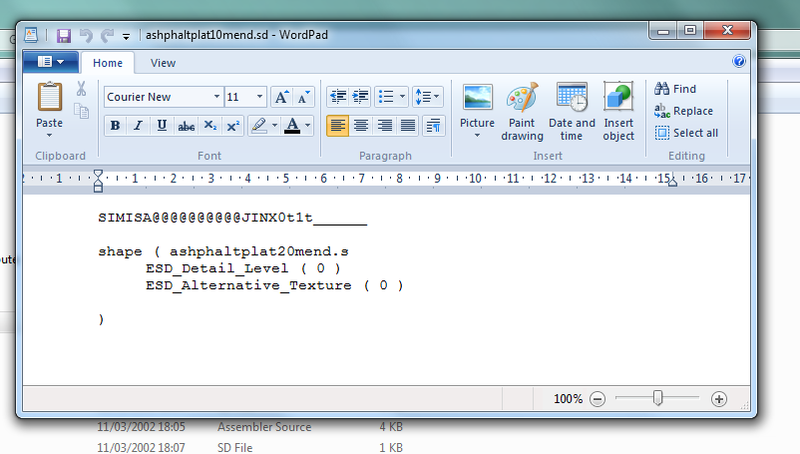 Use a Unicode-aware editor such as WordPad, ConText, or, if you're running Vista or later, NotePad. 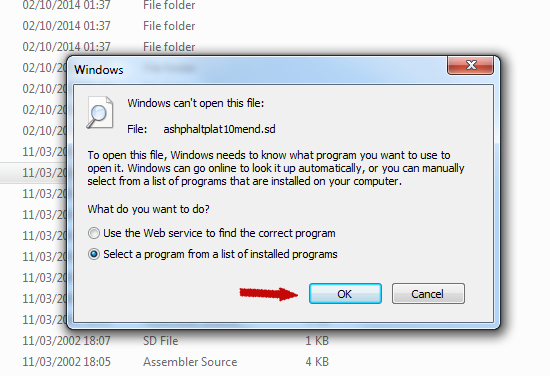 I have windows 7, I would need to create a file association to open these files and quite honestly I do not have a clue what to do. Looks like I will have to "Pass" on this one then. 3. 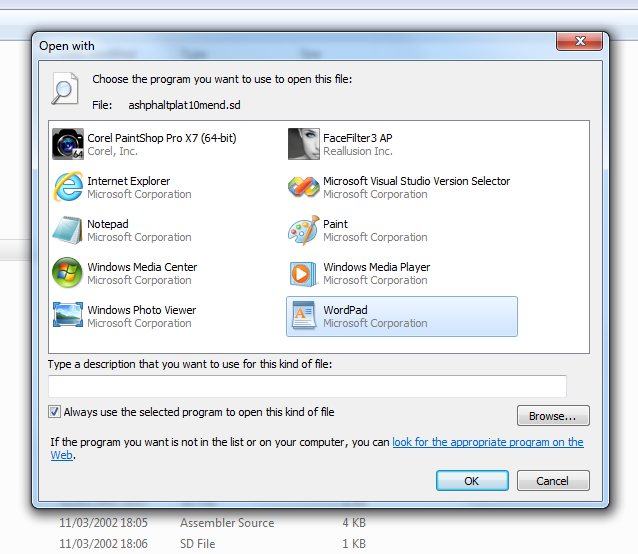 Scroll down to "Choose default program..."
7. 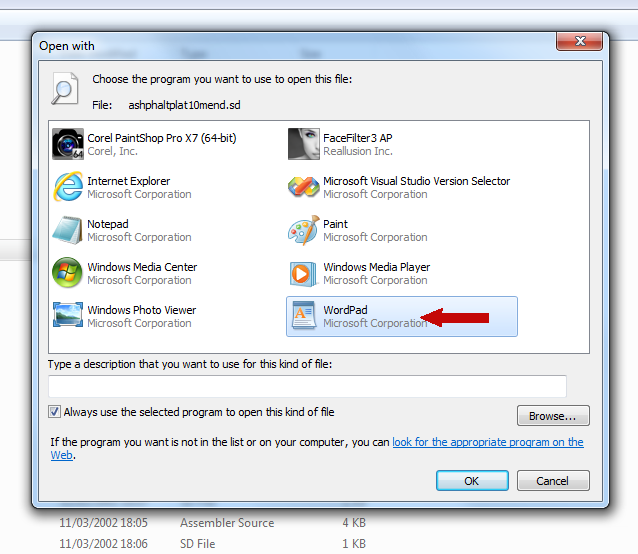 The file will now open up in NotePad and, what's more important, every .sd file will be opened with NotePad. You can do the same procedure for any of the MSTS Unicode files - eng, wag, act, trf, pat, etc. BUT, don't forget to make a copy of the file before you try to change it, then if it all goes wrong, you haven't lost anything, except a few minutes. I was able to amend the SD file by opening with the freeview file which lead to notepad thus amending the figures from two zero to one zero. Sadly it has not made a scrap of difference, still getting the same error message. I don't understand "freeview" file!! If this is not a Unicode aware editor (or whatever it is) then it may have passed the file to NotePad as an ASCII file, which is not recognised by MSTS. Please follow my instructions EXACTLY and please don't use the file you've just created. Delete your new file and copy your original sd file back from your backup and start again. I might just stick my bib in here. My Main Illawarra V3 has been around for nearly six (6) years - when Yuri makes an installer they are literally bulletproof; they are only released after extensive testing on different PC's and software versions. Many hundred copies of the route have been successfully downloaded and installed without problem - no-one, to my knowledge, has reported this problem before. If you read Yuri's install process, there is no specific mention of having to download the platform kits, as the necessary new platform bits are included in the download. So, can I suggest you try to re-install using Yuri's notes, exactly as he instructs. If it still fails, then it is definitely a corrupted platform kit file, if you PM me with your email address, I can email you the 'corrected' file, then all should work as intended. I am unable to open the main OPEN WITH file as nothing happens.at all, instead this error message. 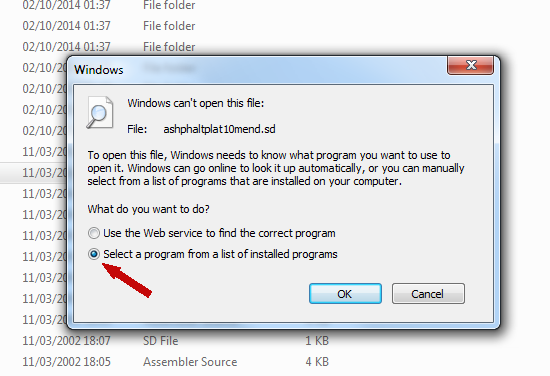 installed,create an association in the Default Programs control panel. Instead, all of the files that I assume should be in the OPEN WITH section are in this Open with freeview folder. I have no clue whatsoever as to why this has happened, It's certainly nothing that I have done. I do not know what an ASC11 file is or how to change it or for that matter what a unicode aware editor is. I never had all this nonsence with XP. Dont know if you can help me, or do I need to go back to the shop. Click on the file that you want to edit and you'll get this message if there is no file association. Then select the option as indicated by the red arrow. 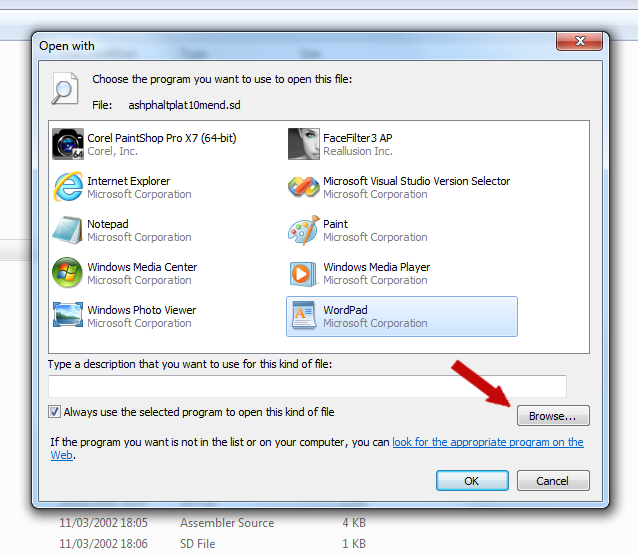 Select the program you want to use to open the file, in this case I have chosen Wordpad but you could use notepad instead if you like. 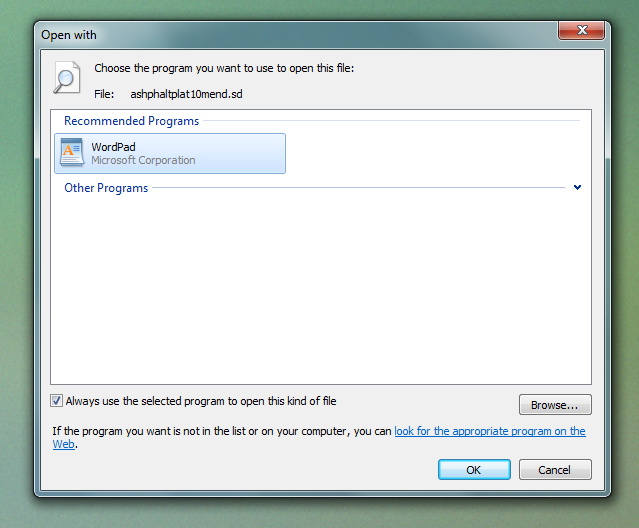 If the program you want is not listed on the screen click here to get a full list of installed programs, you shouldn't need to do this for wordpad or notepad though. After you have made your selection click OK. The file will now open in your chosen program for editing. 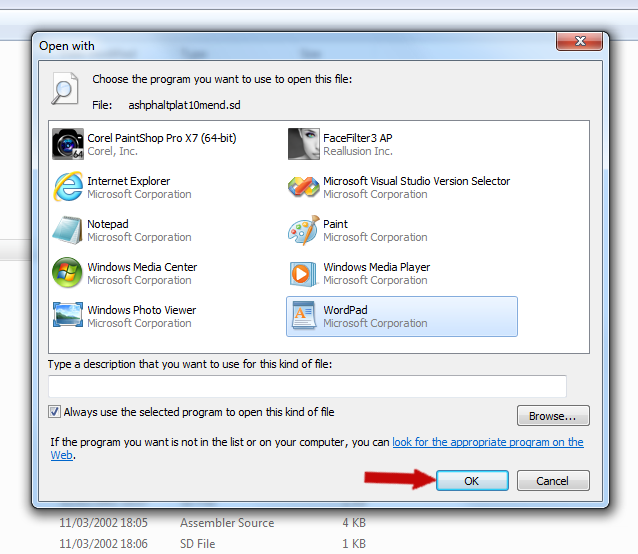 You only need to do this once for each filetype, the next time you open the same filetype it will do it automatically. No, I cannot even get that screen up on the OPEN WITH section, There is absolutely nothing showing! It for some reason has been (and not by me!) transferred to this Open with free viewer thing. suggested that it was a ASC11 file which MSTS does not recognise. So I am completly stuck. Do you get a screen like this but with free viewer instead of wordpad in it, or not showing any program in it?